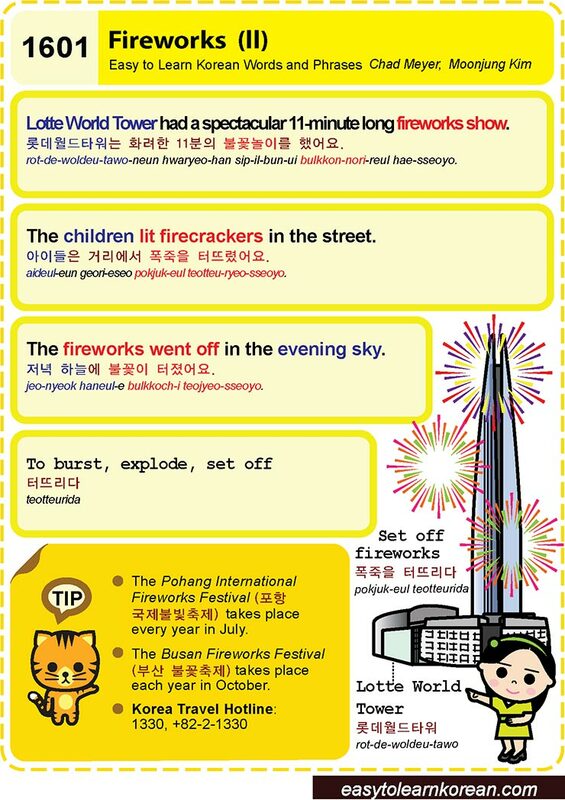 Easy to Learn Korean 1601 – Fireworks (part two). Copyright © 2009-2018 Easy to Learn Korean and the Korea Times. This entry was posted in Series and tagged explode, firecracker, fireworks, Korea Travel Hotline, Lotte World Tower, Lotte World Tower had a spectacular 11-minute long fireworks show., ohang International Fireworks Festival, san Fireworks Festival, set off, Set off fireworks, The children lit firecrackers in the street., The fireworks went off in the evening sky., To burst, 롯데월드타워, 롯데월드타워는 화려한 11분의 불꽃놀이를 했어요., 부산 불꽃축제, 아이들은 거리에서 폭죽을 터뜨렸어요., 저녁 하늘에 불꽃이 터졌어요., 터뜨리다, 포항 국제불빛축제, 폭죽을 터뜨리다 by easykorean. Bookmark the permalink.